Charming Victorian style home bordering acres of ranch land with fabulous pastoral views of Morro Valley. Light, open living area with all new windows to capture the beautiful views, vaulted wood beam ceilings, engineered hardwood floors and brick fireplace add to the ambiance of this lovely home. There is a spacious upper family room or 4th bedroom for your convenience. Tastefully remodeled kitchen with tiled counters and farm style copper sink. Dining area offers cozy window seat and sliding glass door to patio and private back yard where your only neighbors are the cows and horses grazing from a distance. Master bedroom has soaring ceilings, clerestory windows for an abundance of natural light in the loft /library area, and sliding glass door to viewing deck with peeks of Morro Rock and ocean. 2nd bedroom has been freshly painted and upper bath remodeled. Lower level bedroom and bath would make a great guest quarters if desired. Xeriscape allows plenty of time to relax in this quiet peaceful setting or choose to spend more time on the sandy beach just minutes away. Easy access to shopping, fine dining and the embarcadero. 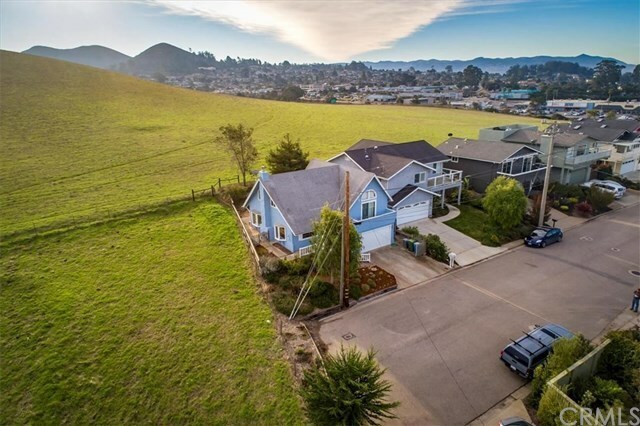 Wonderful location at the end of a cul-de-sac in a quaint, quiet neighborhood of Morro Bay.